Preheat oven to 400 degrees. Thaw puff pastry per package directions. Heat oil in a skillet or saute pan over medium-high heat. Add the baby spinach and cook, 3-4 minutes or until wilted. Stir in garlic and cook 30 seconds more or until fragrant. Transfer baby spinach to a sieve or colander to drain. Gently press on the spinach with a wooden spoon to extract any excess moisture. Combine spinach, chicken, artichoke hearts, herb and garlic cheese spread, Parmesan cheese, mayonnaise and chives in a small bowl. Season to taste with salt and black pepper. Combine egg and water to form an egg wash. Set aside. Roll out and cut each sheet into four even squares. 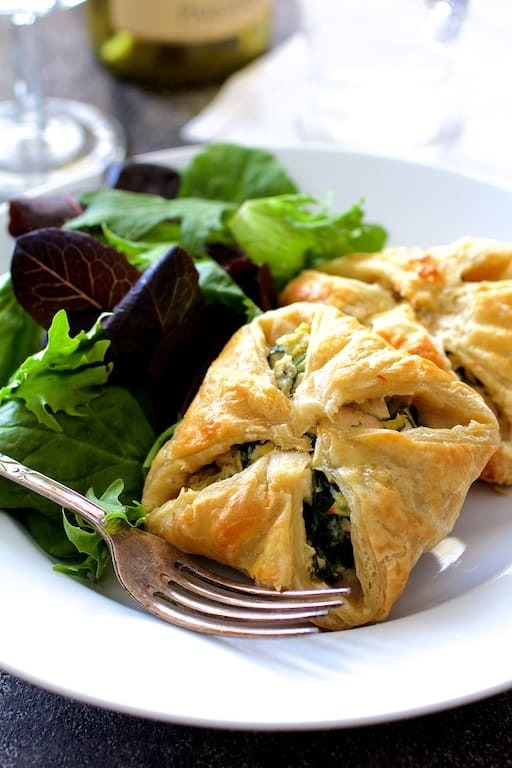 Place even amounts of the chicken filling in the center of each puff pastry square. Dab a small amount of egg wash on each corner of the puff pastry. Pull the corners up and over the filling to form a square parcel. Dab each parcel with egg wash.
Bake for 20-22 minutes or until golden. If the pastry pulls away from the filling, gently press it back down with a spoon or spatula while still hot. Serve immediately.